Chinese New Year (Lunar New Year) is coming around the corner that falls on 14 Feb this year. Yes, it’s also Valentine Day. Coincidently, two great festivals come together this year. For Chinese New Year, Chinese people will celebrate from Chinese New Year's Eve that is known as 除夕(chú xī), literally means "Year-pass Eve" up to 15th. It’s a good time of family gathering, chatting and eating a lot, of course. As for these great seasons coming around, I’ll be sharing more Chinese recipes on this blog. Here comes the first one, Baked Spicy Quail. Many Asian people like to have quails in a festive feast due to its scarcity and delicious taste. 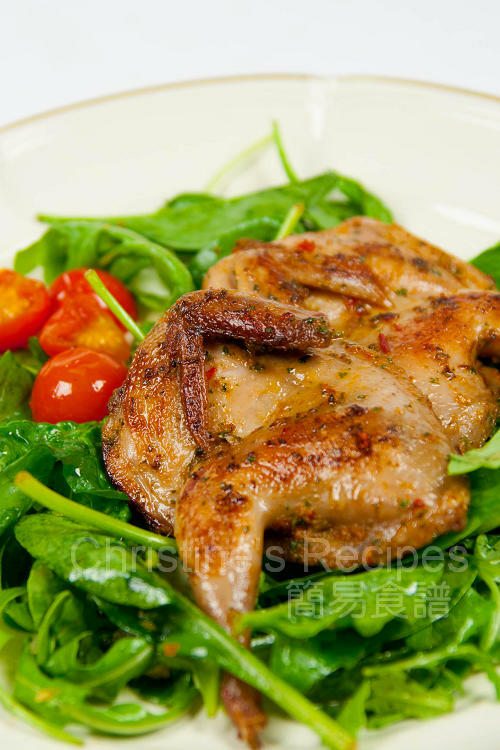 The baked quail is full of flavours, tender and succulent. Rinse quail and drain well. Use a sharp knife to cut each quail along the backbone. Then flatten the breastbone, cut along the breastbone into two halves. Wipe and clean with kitchen papers. Place in a container. Use a small food processor, chop all the ingredients of marinade into a paste. Pour over and coat the quails well. Then marinate in the refrigerator for at least 6 hours, or overnight if time permits. Preheat oven to 180C(356F). Remove the marinade from the quails. Reserve marinade. Heat 2 tablespoons of oil in a frypan. Place the skin side on pan first and cook until both sides are lightly brown, about 3 minutes on each side. 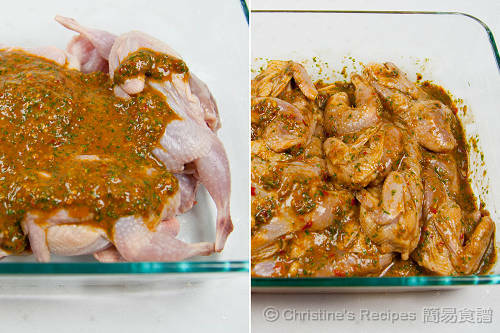 Transfer the quails to baking pan with the reserved marinade and bake for 20 minutes, or until cooked through. Cut open a quail’s leg to test, if there’s no pink meat, it’s done. To serve, mix baby spinach and rocket with oil, vinegar, garlic and sugar. 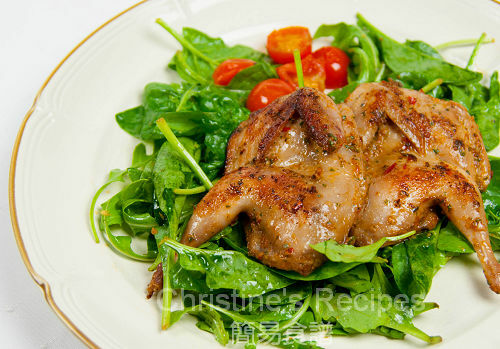 Divide the salad among six plates, then place two quail halves on each plate. The amount of coriander (cilantro) used in this recipe is quite moderate. The coriander imparts a unique fragrance to meat and awakens every cell of your taste buds. If you a big fan of coriander, you might like to add more when preparing the marinade. Some of your family members might not like the unique smell of coriander, you can make two batches of marinade, one without or less coriander. Wow, quail! I love quails! Wow, this is gorgeous! The color of the marinade is so enticing. Yum yum. This quail is of full of flavor from the marinade. I never had baked quail yet. It's usually the deep fried quail with salt and pepper. This would be a nice change. :P This is a good one to do. Looks very delicious. Christine, this is so awesome! Looks so juicy and tender! Not really planned CNY meals. I love quail. They are so small but can be packed with flavour. Oh my, that quail looks so good. Making me super hungry. Great job. This quail makes me so hungry! This dish looks amazing - I've never cooked quail but certainly like to eat it! Thanks so much for sharing! It looks just perfect though quail is not my cup of tea, I think this recipe would be fine with chickens, or drum sticks : ). Your baked spicy quail looks delish! Thanks for asking. It should be 1/2 teaspoon of freshly grated ginger. Updated!